The Days of Johann, an agility dog! : Holiday safety tips! Holiday time can be kind of a dangerous time for us pets if we're not careful, right? During the Holiday season, Mum likes to put candles in the window. It's a tradition, handed down from her Mum, my Grandmum. Mum grew up in this really big, 100 year old, monstrosity of a house. She loved growing up there and always remembers the house being all decked out for the Holidays. But she worries sometimes about the safety of some of these window lights. All the cords around with us and the kitties doesn't mix very well as a safety measure. 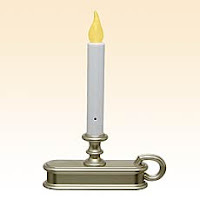 Mum came across these cool lights yesterday - a LED flameless candle. But the best part is that the windows candles have realistic flickering light or full on position, they automatically turn on at dusk and off at dawn, they are battery operated and generate no heat. They also have these really cool outdoor lanterns that Mum liked too. Here are a few more safety tips for you pups this Holiday season! Keep away from that chocolate (and the raisins, macadamia nuts, grapes, cooked bones, well, you get the idea). All that string, tinsel, ornaments, decorating stuff, holly plants and extra electrical cords can be real tempting, but keep 'em out of your mouth, K? They are not good for you! Be sure and tell your two-leggers that presents under the tree are very tempting, so make sure that we don't get in 'em. Tell your peeps that cats sometimes like to climb Christmas trees, and you sometimes like to grab them. They can fall over and cause bad accidents and sometimes fires! Have them secure them to the wall if they need to. A tired dog is a good dog - get your exercise and you'll be less likely to get into trouble.